Hello loves! I am just too excited to share with you one of the greatest achievements I've had so far in blogging. 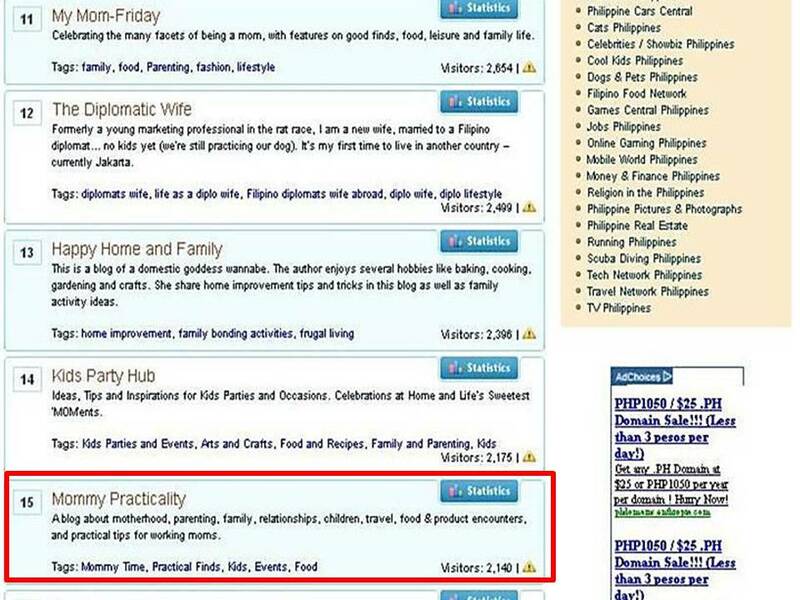 When I was starting my stint as a serious blogger, I registered my website to Top Blogs Philippines under the Home and Living Category. Back then (some 6 months ago) I was ranked 200+ but I didn't mind because I was just starting. I just kept on writing, self-studying about SEOs, blog hopping, admiring and learning from my Mommy/Lifestyle Blogger Inspirations, kept on improving and just wished someday I will be ranked among Philippine's Top 20 Home and Living Blogs. Shivers to the spines kind of feeling because I was ranked close to my Blogger Inspirations. My admiration list now includes Mommy Fleur, Mrs Martinez Raves And Rants, and Animetric's World apart from those mentioned in my previous Mommy/Lifestyle Blogger Inspirations post. So what now? Just the same, I'll humbly continue this journey I've chosen to take, to help fellow moms with their needs. I will continue to give relevant information and content that a practical parent may be looking for. May I someday, be a source of inspiration to others too. I would love the opportunity to help our online mommy community in any way I can. wow, # 15 na, this is such a great news! Congratulations Louise! :) I'm sure, you are already an inspiration to many. Thanks @facebook-1499477397:disqus I really hope so. Been working hard at this other passion. :) You are too for many women as well! Thanks @twitter-120629440:disqus . I've been working hard, I do hope to be able to sustain it. Thanks @disqus_U34QIx4U2a:disqus it took a lot of studying about this craft that I'm passionate about din, it's hardwork din. Thanks! wow congrats mommy maye! :)) my personal/lifestyle was also included on the top 10 of top blogs.. hihi.. :) i just hope my beauty/fashion will be on the top 100 nlng kahit papano..
@85c83b543f73457c4bef58f845308b3e:disqus THANK YOU!!!!!!!!!!!!!!!!!!!!!!!!!! Super KILIG to the bones ako right now!!! HIHIHIHIHIHIHIHI!!! hindi naman masyadong halata diba? Thank you Thank you Thank you!!! Aaaww! Thanks so much sis! :) I'm glad to be inspiring mommies/women like you! That's why I started blogging to do just that! :) I feel more blessed now that I'm able to touch people's lives in one way or another! Thanks so much sis! :) huuugs! :) How are you? Have you given birth already?